Made of high-quality lead-free brass, our designer kitchen faucet is a real standout – and a great opportunity for you to set yourself apart. This reverse osmosis faucet features a smooth operating ceramic disk element, lever style handle, high reach neck design of 12”, protective spout tip to prevent after drip, and a patented modular air gap. The Designer Reverse Osmosis faucet retrofits most brands and is shipped complete with preinstalled tubing for quick connections. Choose from 9 designer finishes to compliment virtually any décor! All reverse osmosis faucets are NSF listed to ANSI NSF Std. 61 - 9 & 372. 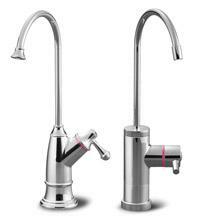 Tomlinson's Contemporary Reverse Osmosis Faucets add high style to the high-end kitchen. Nine fabulous finishes give dealers and distributors lots of ways to up-sell customers. 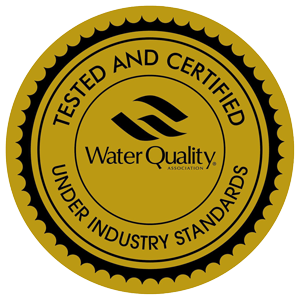 Plus, the lead-free brass construction of these reverse osmosis faucets is quality all the way. This contemporary kitchen faucet features a smooth operating ceramic disk element, lever style handle, high reach neck design of 12”, protective spout tip to prevent after drip, and a patented modular air gap. 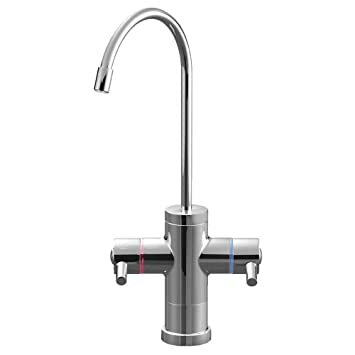 The Contemporary Reverse Osmosis faucet retrofits most brands and is shipped complete with preinstalled tubing for quick connections. Any of the available designer finishes can complement virtually any décor! All reverse osmosis faucets are NSF listed to ANSI NSF Std. 61 - 9 & 372. 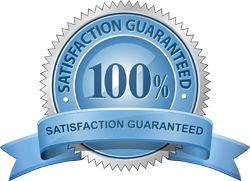 Two-year warranty. Tomlinson now offers Hot and Cold Water Faucets designed to work with instant hot water dispensers. These faucets can also be adapted for use with RO systems. Available in both Designer and Contemporary styles, these beautifully crafted hot and cold faucets give you the flexibility you need for today’s upscale kitchens and entertainment areas. These hot and cold faucets feature a smooth operating ceramic disk element, lever style handle, high reach neck design of 12” and a protective spout tip to prevent after-drip. For additional safety, this faucet also has self-closing “hot” handles. Hot and cold faucets are shipped complete with preinstalled tubing for quick connections. 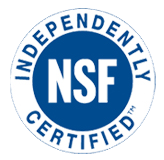 All faucets are NSF listed to ANSI Std. 61 - 9 & 372. 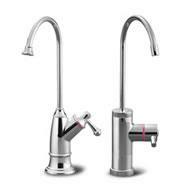 Tomlinson now offers a Hot Water Dispenser Faucet specifically designed to work with instant hot water dispensers. Available in both Designer and Contemporary styles, these beautifully crafted hot water faucets give you the flexibility you need for today’s upscale kitchens and entertainment areas. These hot water faucets feature a smooth operating ceramic disk element, lever style handle, high reach neck design of 12”, protective spout tip to prevent after-drip and self-closing “hot” handles for additional safety. 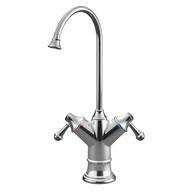 This hot water dispenser faucet is shipped complete with preinstalled tubing for quick connections. Faucets are NSF listed to ANSI Std. 61 - 9 & 372. Lead-free ceramic disk reverse osmosis water system faucets are available in 5 styles and 3 finishes* offer many options to coordinate with any decor. These reverse osmosis faucets feature engineered plastic housing and plastic water passages. Each RO faucet has 36" pre-installed 1/4" inlet tubing and 3" inlet shank with 7/16-24 threads. The lead-free gooseneck spout on this reverse osmosis faucet swivels 360 degrees. Polished chrome plated finish is standard on this faucet; available in satin nickel in most value reverse osmosis faucet styles. *VS802 style available in polished chrome only.